Want Your FREE Trial Class? We believe in the power and impact of inner strength, mental toughness, and community. With the right mindset, tools, training, and discipline, the human body can do extraordinary things. Our mission is to unlock the full potential inside every athlete and help them realize a more fulfilling & rewarding lifestyle through strength, fitness, and nutrition. Whether "fit" to you means excelling in competitive athletics, or the ability to fully engage and play with your kids, a regular fitness regimen is a critical component in your ability to live the life you want to live. Our system consists of constantly varied workouts using a wide range of functional movements performed at a high intensity. We use a combination of weightlifting, body resistance, dynamic movements, and metabolic conditioning to develop our athletes and more importantly, prepare them for the challenges of everyday life. The results speak for themselves! I’d like my FREE trial class! At CrossFit Willowbend, we pride ourselves in being a place where athletes of all levels feel welcome and a part of our community. Our experienced training staff is constantly working with members to improve technique, build strength, increase mobility, and develop a deeper understanding of why these things are important. Each class is led by a certified CrossFit instructor and the team environment motivates you to push yourself beyond any do-it-yourself gym workout. Members encourage one another while challenging everyone to reach their fullest potential. 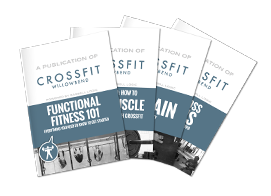 CrossFit Willowbend provides an important feeling of community and accountability that is often missing from the Globo-gym setting and other fitness programs. Here, you’ll find ordinary people doing extraordinary things. CrossFit Willowbend is a diverse community that includes members of our military, full-time moms and dads, doctors, lawyers, police officers, fire fighters, business executives, elite athletes, teachers, students, kids, and retired grandparents. Come out and join us for a workout. No matter your current fitness situation, we are ready to take you to the next level. Since I started I have lost 30+ lbs, I eat healthy, have motivation, energy, got rid of my constant heartburn, no longer snore, dropped my blood pressure and cholesterol levels dramatically, am less stressed and my wife says she sees muscles again which have been hiding since I was 23 at least. After months of toying with the idea of CrossFit and finally being talked into trying something different, I'm hooked. There's no greater feeling than slamming a barbell on the floor one day, and hitting a race PR the next day. AND a family friendly environment that supports fitness and watches your children at the same time is a double whammy! Love my CFWB fam!